I’m not sure about you, but I love fashion. It seems like nothing compares to the feeling of finding the perfect pair of earrings or the most unique oversized bag, and to find those items at a cheap price can make this moment truly euphoric. However, it can be difficult to find wardrobe pieces that are different. Shopping at the mall, or your nearby outlet store, can become extremely redundant and boring. But, thankfully, thrift stores are a great alternative. 1. Do your research. Search for thrift stores in your area and check out the reviews previous shoppers have left. Try to find someplace well kept and with a dressing room. 2. Set aside plenty of time for shopping; thrift stores usually have a lot of merchandise. 3. Set a budget and bring a calculator. Thrift stores often have discounts between 25%-75% off. By calculating your total bill before reaching the register, you won’t overspend. 4. Closely examine your merchandise for damages before purchasing it. If your clothing is damaged, you can either not purchase it, or you could try requesting a discount. 5. When purchasing clothing, make sure it is made of quality material. Materials such as cotton, denim, wool, and leather are more sustainable than polyester, acrylic, rayon, and nylon. 6. Wash clothing properly before wearing. Be sure to check the tags of your clothing to see how to properly wash it. Some items may be dry clean only or have to be washed in a specific water temperature. 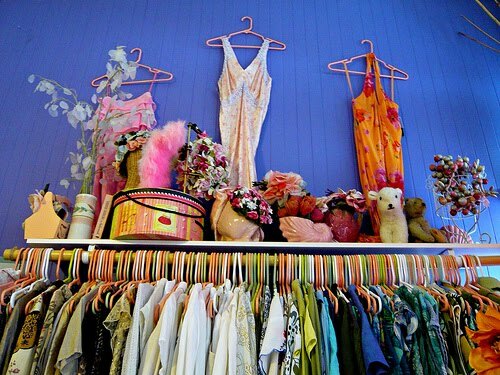 What’s the best thing you’ve found in a thrift store? I love this! I found TOMS look-alikes last weekend for $5. This past fall, I found a $90 Steve Madden bag with the tags still on it for $15 from Savers. But despite all the stuff I find, the best part is the hunt! I know the hunt is definitely the best part. You never really know what you are going to find. This is a great article! I love thrifting and I believe every college student, especially the female students should have their share in the thrift store. It helps to keep your bank account from going low(er) as well as helping with staying up with fashion (believe it or not). There are some great finds in those stores. I love them! Again, great article. I found a designer piece of luggage that normally retails for around 300 for 5 dollars at Savers! Sweet sunglasses for 99 cents. Tshirts that are from the 90s from the 4 dollar rack.